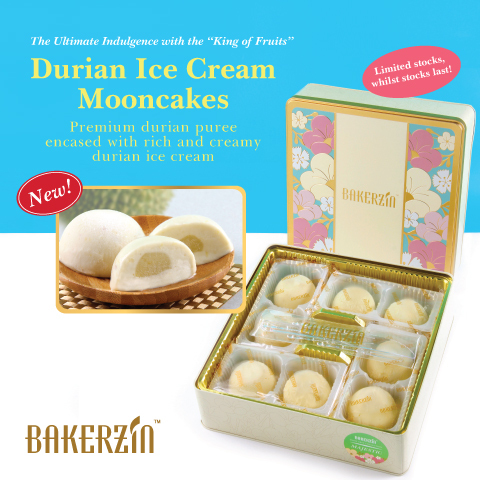 The Durian Mooncake is Back! Monday | September 18, 2017	Due to the overwhelming popularity of our Signature Durian Mooncakes, the first batch of stocks were snatched up within the first three days of the launch! Here's a fantastic piece of news for the fervant fans of the "King of Fruits". We have heard your pleas to restock and we are releasing a new version of the Majestic Collection - The Durian Ice Cream Mooncake. Featuring premium durian puree encased with rich and creamy durian ice cream, the new Majestic Collection comes in 8 pieces per box for SGD70. Available now at Bakerzin outlets, online eshop, retail booths and OCC Paragon and OCC Raffles Place. Shop now to enjoy a 12% OFF* and additional 15% OFF* for DBS/POSB card holder. *Terms and Conditions apply.